The proposed Kwispaa LNG facility would be built in Sarita Bay, approximately 80 kilometres southwest of Port Alberni (photo courtesy Kwispaa LNG). Those behind a proposed LNG facility in Huu-ay-aht territory have submitted volumes of documents to government regulators, with the hope that an $18-billion development in Sarita Bay will be realized to meet the world’s burgeoning demand for the resource. Today the Huu-ay-aht First Nations and Steelhead LNG announced the submission of a project description to the BC Environmental Assessment Office and the Canadian Environmental Assessment Agency. The project description includes an overview of Kwispaa LNG, a jointly owned export development the partners plan to build in Sarita Bay on Huu-ay-aht land. This latest submission is the result of years of preparations since the partners announced the project in 2014, including environmental studies and engineering work. Kwispaa has already received export licences from the National Energy Board for up to 24 million tonnes of liquefied natural gas annually over 25 years. The development is expected to bring 350-400 long-term jobs to Sarita Bay, which is located near Bamfield and approximately 80 kilometres southwest of Port Alberni. 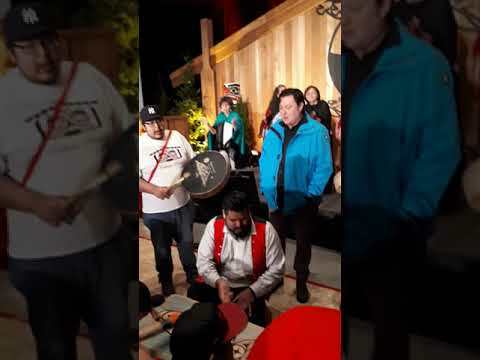 “This project will create meaningful revenues, jobs and business opportunities for Huu-ay-aht citizens and our neighbouring communities, as well as generate ongoing tax revenue at a local, provincial and federal level,” said Huu-ay-aht Councillor John Jack, who is also chair of the Alberni-Clayoquot Regional District. The export facility would receive natural gas transported by pipelines from the interior of B.C., then liquefy the resource by cooling it to -160 Celsius before being shipped to overseas markets. The provincial government lists 13 other LNG projects in various stages of development on the West Coast, including the $40-billion LNG Canada initiative in Kitimat. This is Canada’s first LNG project to begin construction after a final investment decision was announced Oct. 2, with the approval of the provincial and federal governments. Huu-ay-aht Chief Councillor Robert Dennis Sr. takes LNG Canada’s progress as a positive sign for the future of Kwispaa. “It might help the development because you now have the B.C. government at least willing to look at natural resource development in B.C. – in particular LNG,” he said. According to a report released earlier this year by Royal Dutch Shell, which is the world’s largest supplier of LNG, an international shortage is expected by the mid 2020s if more export facilities aren’t built. Dennis believes that the massive Kitimat project won’t take away Kwispaa’s potential customers. Dennis noted that the partnership has already benefitted the Huu-ay-aht through support given to local initiatives, including the renewal of riparian zones along the Sarita River. “I’ve been a chief councillor for 20 years and this project has probably contributed more in the past two years than all the work done previously by different governments and different resource developers,” he said. A final investment decision on Kwispaa LNG is scheduled in 2020. The export facility is expected to begin operations in 2024.